The pace of producing U.S. coins slowed for a third year in a row after peaking to a 14-year high, the latest manufacturing figures from the United States Mint show. In 2018, production facilities in Philadelphia and Denver shipped over 13.1 billion coins to Federal Reserve Banks for distribution into the economy, marking decreases of 11.7% from the more than 14.8 billion coins made a year earlier and 18.1% from the over 16 billion coins struck in 2016. Contrast the latest annual figure to 2015 when the U.S. Mint beefed up operations and hired more workers as demand for coinage ran higher for a sixth straight year and drove production above 17 billion coins. That said, the pace in 2018 was 269.9% quicker than in 2009 when U.S. coin production hit bottom at just over 3.5 billion coins. U.S. Mint facilities in Denver and Philadelphia manufacture all of America’s coins for commerce. Last year, the Denver Mint made 6,284,980,000 coins and the Philadelphia Mint made 6,840,434,000 coins. Mintages of Kennedy half-dollars and Native American dollars are smaller than other coins because they are no longer produced for circulation — Federal Reserve Banks do not order them from the U.S. Mint. The two coins are now made only for numismatic products. Mintages for the 2018 Kennedy half-dollar total 6.1 million from Denver and 4.8 million from Philadelphia for a combined 10.9 million coins — the most since 2001 and more than doubling those made in 2017. The prior year’s release ended with splits of 2.9 million from Denver and 1.8 million from Philadelphia for a combined 4.7 million coins. Mintages for the 2018 Native American dollars total 1.4 million from Denver and 1.4 million from Philadelphia for a combined 2.8 million coins — down from the previous year’s release which ended with splits of 1.54 million from Denver and 1.82 million from Philadelphia for 3.36 million coins. In unit totals and keeping with practice, 2018 Lincoln cents won among denominations with more than 7.8 billion made — even as it costs the U.S. Mint 1.82 cents to make and distribute each one. The 7.8 billion figure represents 59.5% of the 2018 production total. This next table shows 2018 circulating coin mintages by production facility, denomination and design. Mintages of the U.S. Mint’s program of America the Beautiful Quarters® had grown stronger each year until 2016. The overall production of quarters slowed again in 2018 with a bit more than 1.85 billion million made, marking a 12.4% decline from 2017. 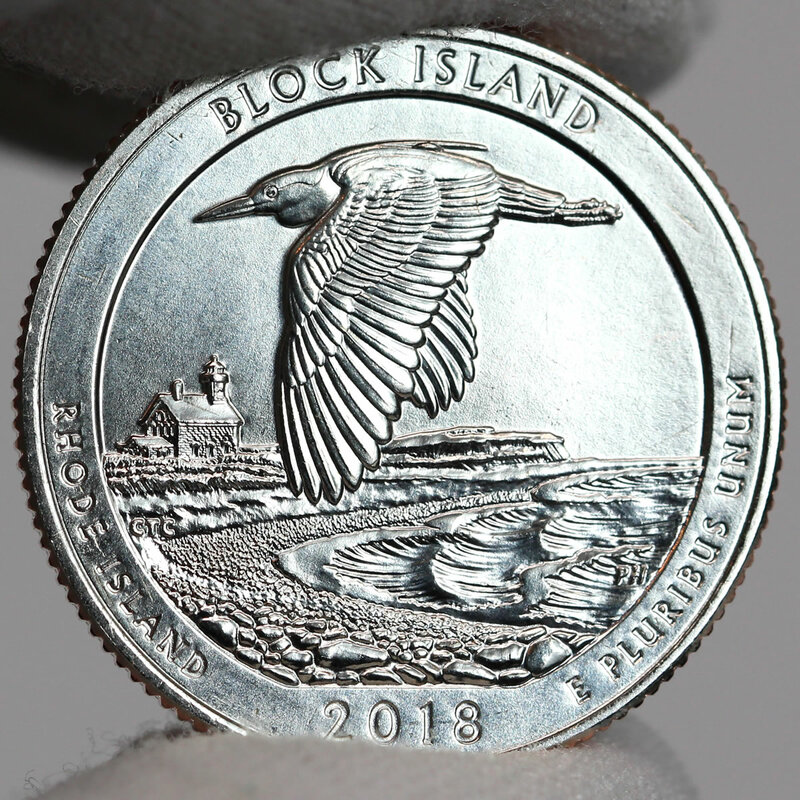 Official mintages for Rhode Island’s Block Island National Wildlife Refuge quarters were reported for the first time this month, registering at 159.6 million from Denver and 159.6 million from Philadelphia for a combined 319.2 million. Forty-five different quarter designs have been released from 2010 to 2018. The 2016 Harpers Ferry National Historical quarter for West Virginia remains the mintage leader by design at 858.63 million quarters. The 2012 Chaco Culture National Historical Park quarter for New Mexico remains at the bottom of the production charts with a total mintage of 44 million. 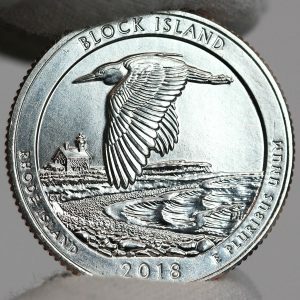 The scarcest America the Beautiful quarter dollar issue by production facility is the Denver Mint-struck 2012-D Acadia National Park quarter at 21.6 million. The ‘P’ and ‘D’ Chaco Culture quarters follow with each at 22 million. December is almost always a weak coin production month as the U.S. Mint readies its tooling for the upcoming year’s coins. Some Decembers have actually come in at or near flat for production amounts. Last December logged in with 560.64 million coins, down 26.5% from December 2017. Compared to November, the level dropped 45.6%. Coin production figures in this coin news article are based on data aggregated from the Mint’s webpage at: https://www.usmint.gov/about/production-sales-figures/circulating-coins-production.